M-G-M Record DebutWinning Raves (although no prizes) when they recently appeared on the Arthur Godfrey "Talent Scouts" show, the Normanaires loom as the classiest vocal group on the scene since the heyday of the Pied Pipers. 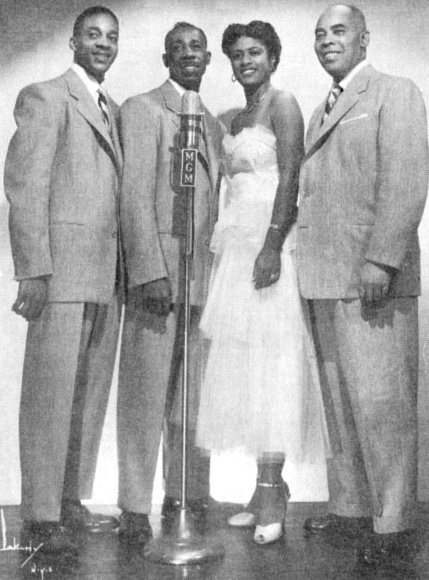 Taking their name from composer-arranger Fred Norman, the group is composed of (left to right) Malcolm Williams, William Glover, Doryce (the doll) Browne, and Samuel Dillworth. The Normanaires first release on MGM record, "My Greatest Sin" and "Wrap It Up" is being embraced by disc jockeys all over the land.